If you would like to attend tonight's Meal Prep Workshop, but have not signed up yet, you may do so. However, anyone who signs up today will NOT receive a take home meal tonight. 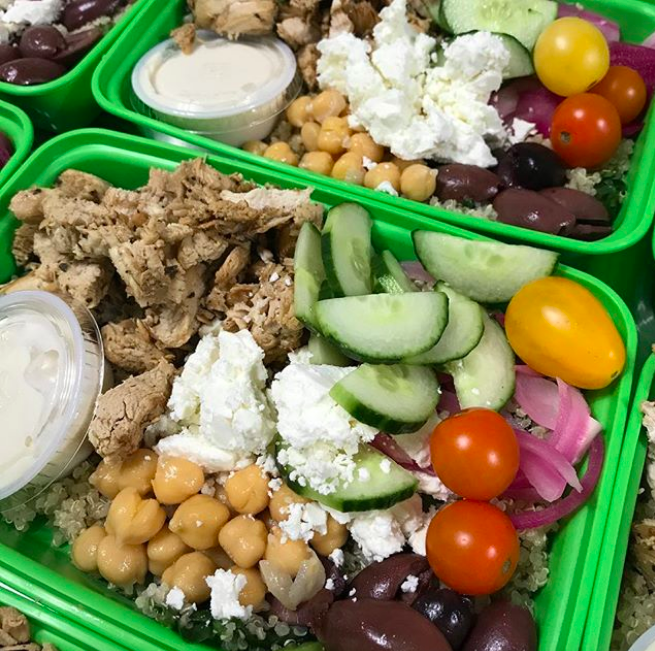 Your meal WILL be delivered to our Severna Park studio this Friday 1/26 when Eat Sprout makes their delivery. Workshop cost is $32, which includes recipes, shopping list, snacks and a take home meal. Reservations must be made in advance. Mantra Fit and Eat Sprout want to help you be successful at eating better food that supports your weight loss goals and fuels your body for health and performance. Join us for a meal prep workshop and healthy cooking demonstration Wed, Jan 24 at the Manhattan Beach Clubhouse in Severna Park. Samples will be provided, along with a take home meal. Eat Sprout prepares and delivers healthy, fresh meals sourced from local farms and organic ingredients. Based on the Eastern Shore, its led by Ryan and Emily Groll, a husband and wife team who are passionate about healthy living and helping others thrive. As experts in the health, fitness and the food industry, they believe your taste buds are made happiest by food that’s crafted close by, in smaller batches and by certified nutritionists interpreting great recipes. Rather than stamping out huge quantities of meals from some giant kitchen and trucking them all over the world, Eat Sprout works direct with local farmers to bring you a great variety of tasty prepared meals, specific to your needs – all dreamed up locally and giving back to the community. Mantra Fit is proud to be their Severna Park Sproutlet hub. Order your meals off the Eat Sprout website, and pick them up on Tuesdays and Fridays at Mantra Fit's fitness studio at 760 Ritchie Hwy in Severna Park (next to Cafe Mezzanotte).